The Continental Congress was a convention of delegates from the Thirteen Colonies. It governed the colonies before and during the American Revolution and met three times from 1774 to 1789. 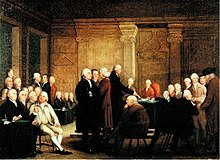 The Second Continental Congress met in Philadelphia, Pennsylvania starting in May of 1775. It was made up of representatives from all 13 colonies. On July 4, 1776 the Congress approved the United States Declaration of Independence, which was mostly written by Thomas Jefferson. The Second Continental Congress was formed partly to manage the colonial troops fighting the Revolutionary War. Troops fighting for the colonies were known as the militia army led by George Washington. This page was last changed on 29 March 2019, at 04:11.